Success of a CMS web development project is invariably and intrinsically associated with the efficiency of your chosen HTML editor. Choosing wrong or inefficient HTML editor can have disastrous impacts on your ongoing CMS web development project and that means you have to be a bit more cautious to ensure smooth completion of a project next time. 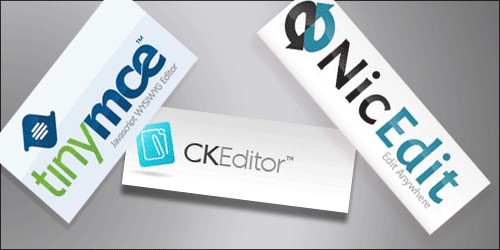 CKEditor is available under flexible Open Source and commercial licenses and it can be integrated in any application easily and effortlessly. It is highly customizable. You can change plugins, force attributes and themes if you wish. It is easy to integrate with any CMS. It is compatible with almost all modern browsers. For saving and loading content, AJAX can be used seamlessly with this HTML editor. jWYSIWYG: – It is an inline content editor that allows users to edit HTML content. It is more or less a viable alternative of WYMeditor but this is not half as feature rich as the WYMeditor. However, it is still good at creating tables and some other basic tasks. NicEdit: – It is another popular HTML editor that is extremely lightweight and at the same time, it is compatible with almost all major web browsers. It can be easily integrated into any CMS within few second. What’s more, it can be employed for converting standard text areas to rich editing. YUI Rich Text Editor: – This HTML editor works fine with YUI library and it is highly customizable. A high level of customization is possible with YUI Rich Text Editor, as there are options for advanced implementations. It’s the best option for the Enterprise (e.g. it’s the first option for companies like IBM and Oracle) and all kinds of web systems, like CMSs, CRMs, Blogs, Wikis, etc. Excellent and nice post! Thanks for this important data. Valuable info. Fortunate me I discovered your website unintentionally, and I am shocked why this coincidence did not happened earlier! I bookmarked it.